How quickly could veganism realistically grow if changing attitudes wasn't the limiting factor? We've already heard that the world can't go vegan overnight, but if not overnight then how long? I'm curious about how quickly veganism could grow under three scenarios. For this question, consider two reducetarians eating 50% less meat the same as one full vegan equivalent (1 FVE). So I'm asking about changing food supply, not how many people self-identify as vegan. Scenario 1 - Animal agriculture stops expanding and maintains current levels. The human population keeps growing, but all new food demand is met with plant-based options so meat consumption per capita slowly drops. Retiring farmers are replaced by young farmers and slaughtered animals are replaced by newly bred animals. Scenario 2 - Animal agriculture goes out of style and nobody wants the job. Livestock farms shut down as farmers retire. Farms continue to breed and slaughter animals, but there are fewer and fewer farms as time goes by. Scenario 3 - We stop breeding any new animals on farms. Everybody agrees that it's time to end the practice of farming animals in a prudent way. Farmers continue raising the animals currently on their farms and send them to slaughter as before, but the animals alive right now are the last ones to be living on farms. Meat production declines rapidly. 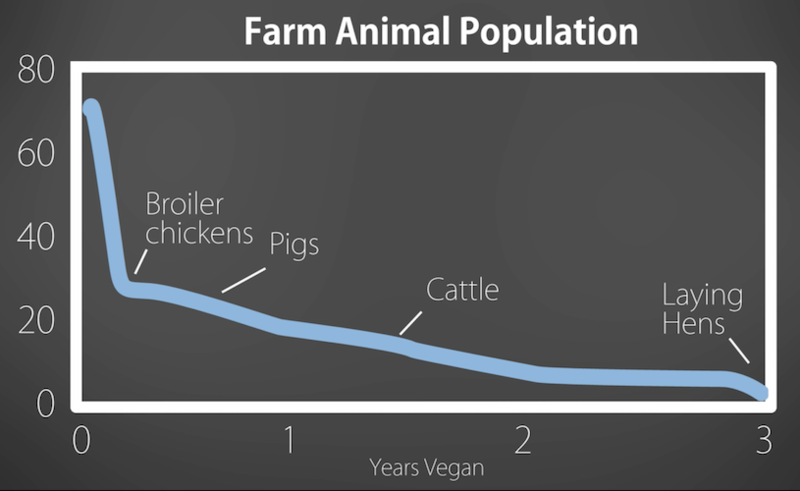 What would the growth curve of veganism look like under these scenarios? (To simplify the question, assume that plant-based food options can be scaled up instantly in response to changing demand.) How long would it take for all of the slaughterhouses to go silent and empty? Have any researchers already tried modelling this question? The vegan YouTuber known as Mic. the Vegan recently posted a video on this subject. 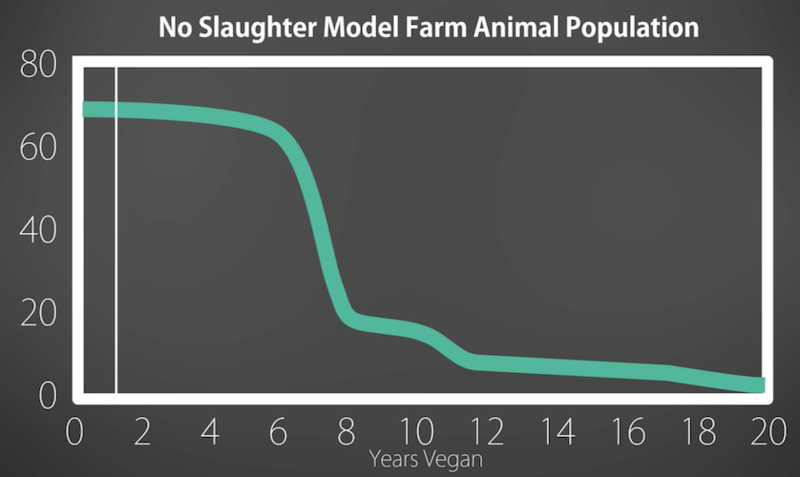 Here's a graph showing how many farmed animals would remain if all farms immediately ceased animal breeding but continued with animal slaughter (scenario 3). Under this scenario it would take three years for all the slaughterhouses to shut down, and presumably all humans would be following a 100% plant-based diet. He also modelled a different scenario where all farms immediately stop breeding and slaughtering so that all animals currently alive on farms would live out the rest of their natural lives. Naturally, this made for a lot longer transition. Not the answer you're looking for? Browse other questions tagged veganism outreach commercial-farming livestock-industry economics or ask your own question. Is it consistent with a vegan philosophy to buy and wear secondhand leather products? How is the rate of growth of veganism and vegetarianism changing over time? How much more would beef cost in the USA without government subsidies? Would vegans eat fruits with worms? How much land and water is used for farming animals? How can I prove to people that going vegan reduces animal slaughter?